They attack nationalists and act to close down Nationalist organisations, meetings and internet sites (because they have a totalitarian attitude against those who disagree with them on racial matters). They cannot acknowledge nationalism and racial patriotism as valid alternative viewpoints (because their minds are so bigoted and closed, they cannot even envision that a viewpoint that is so diametrically opposed to their own could be valid). They seek to silence the voices of opposition to their world-view, even seeking to jail those who dare to voice their opinions (because, in reality, they oppose freedom of speech unless it falls within the parameters of what they deem acceptable). Freedom of speech means defending everybody's right to speak, especially all of those to whom you are totally opposed - to do otherwise, whilst paying lip service to "free speech", is to be both a hypocrite and a liar. Multiculturalists attack free speech by censorship, intimidation, threats, and violence. As an example of Multiculturalist censorship, Murder By Media, a book by Scott Balson dealing with the censorship suffered by Pauline Hanson, was itself affected by censorship when a major bookseller indicated that it would no longer sell it. One aspect of Multiculturalism that most members of the public don't see is that of Multiculturalist intolerance and hatred. Nationalist activists have seen the ugly face of Multiculturalism over a span of many years, often coming across Multiculturalist thugs who desperately want to silence serious opponents of Multiculturalist policies - attacking Nationalists in a variety of ways. With the advent of the large Pauline Hanson movement in the 1990s, the public finally got to see the truly ugly face of Multiculturalist hatred. John Bennett, in the civil liberties book Your Rights, gives some background details. Frank Devine (Australian, 5/6/97) referred to an earlier article by Nicholas Rothwall, who stated that nearly everyone who spoke favourably of Hanson refused to divulge his or her name for fear of reprisal. Devine comments "Fear of Reprisal? For expressing a political opinion? In Australia? Good Grief". 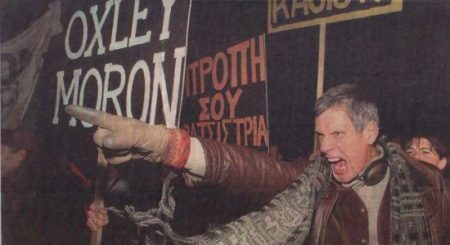 Devine noted that opponents of Hanson, not her supporters, were responsible for violence at meetings such as a meeting addressed by Hanson in Newcastle in June 1997 which led to the bizarre and comical paradox of 300 policemen, not to defend Asians and Aborigines against the savagery of Hansonites but to stop the rampant politically correct from scragging 1400 reputable citizens who paid to hear her speak. ... those with tactics most reminiscent of the hooligan intimidation tactics of the Nazi brownshirts were to be found in the ranks of the anti-ON demonstrators. One demonstrator having knocked an elderly ON supporter to the ground at Echuca said ominously "we know where you live". The publication of the list on ON members including the suburb in which they lived was also intimidating. Michael Duffy (Daily Telegraph, 1/8/98) said that it's disturbing to see the sort of thing that worries us these days - and the sort of thing that doesn't. This selective outrage is a particular feature of the Hanson phenomenon. Duffy said that some of the anti-Hanson demos have prevented Hanson from speaking. This is an outrage to Australian tolerance, democracy and free speech. "Never before, to my knowledge, has the leader of a mainstream political party with over 300 branches and representatives in two Australian parliaments been prevented from speaking in public. This raises questions vital to the health of Australian democracy". ...Duffy reported the violence directed against old people and young women by demonstrators at the Hawthorn Town Hall and said that "it was Australian democracy 1900s style, typical of what many people have had to put up with to hear Pauline Hanson speak during the past 18 months". He said that Jeff Kennett's police did a deal with the demonstrators, and the meeting was called off in return for the physical safety of the people who had come to hear a federal politician speak. "It was a black day for Australian democracy. It's difficult to know who deserves more of our contempt - the thugs who are now using physical force to repress free speech, the politicians and police who are letting them get away with it, or the moral posturers who, with their spurious outrage about ON racism are condoning increasing levels of violence and repression". The Free Speech Committee referred to the ugly face of censorship and said that it is the right of the people to assemble and express their opinion in meetings and demonstrations. It is a fundamental right of all people, regardless of their opinion, that they should be free to speak what is on their minds. Obstructing entry to a hall and shouting down speakers are forms of censorship which are not tolerable in this society. It is important that the principle of free speech and tolerance be safeguarded at all times, and never more so than when dealing with intolerance. The demonstrators in Hawthorn, obstructing entry to the ON meeting may have been well motivated, but their tactics were misjudged and indefensible. 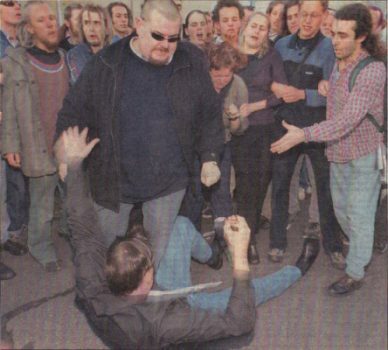 Michael Barnard (Sunday Herald Sun 2/8/98) said that it is the anti-Hanson, anti-ON demonstrations which enshrine a consistent new low, and that records illustrate that throughout the ON saga, the woeful incidents of violence - including intimidating women and bashing elderly men - come from a hooligan fringe into which students and school children are drawn; preventing people entering a lawful meeting to hear a duly elected member of Federal Parliament is the antithesis of democracy. ...Barnard said that "Yet, in the main, a strange silence pervades. Imagine the outcry if angry farmers disrupted a meeting of the Aboriginal and Torres Straits Islander Commission, or if some other group, screaming Nazism, sabotaged a convention of multicultural bureaucrats. ...In despair, one looks at the printed record and finds a broad strand of hypocrisy - or is it blindness? - running through weeks of political utterance and media commentary. Yes, one discovers, the excesses of the demonstrators, have been lamented to a degree. But not, first, because the violence and intolerance are simply and plainly wrong in themselves, but because they will help increase sympathy and support for Mrs. Hanson. ... The Age for instance did not publish even one feature article about the dangerous precedent set by the mobs which prevented Hanson, then the leader of the third largest political force in Australia, from addressing meetings in Hobart and Melbourne. Paul Sheehan, in his book Among The Barbarians: The Dividing of Australia, also wrote about Multiculturalist hatred. another reality of Australian politics is that Pauline Hanson has been spat on, subject to numerous threats, her younger son has been stalked and she has received a torrent of racist abuse from Aborigines. 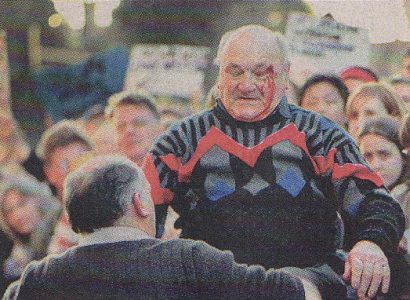 One Nation's opponents covered themselves in disgrace in 1997. Hundreds of people were subject to a gauntlet of insults and projectiles as they attended One Nation meetings. Many were threatened, some were beaten. A docile news media and Labor Party both watched as a systematic assault on freedom of speech and freedom of assembly took place - in the name of tolerance. The violence culminated, inevitably, with a serious assault when fifty-nine-year-old Keith Warburton was bashed by three goons calling him a 'Nazi' as he came out of a One Nation meeting in Dandenong, Victoria. He had attended the meeting out of curiosity. 'I'm just an individual without political leanings,' Warburton said later. Political curiosity carried a high price in Australia in 1997. Extremist Multiculturalists tend to take their beliefs as a religious conviction. They think that their side is good, and anyone who differs must therefore be evil - and it's okay to hurt evil people. It's a sick viewpoint, and � when expressed by those in government and the media � it undermines the basic principles of democracy. Letter writers to newspapers who have criticised immigration, Multiculturalism, and/or Asianisation are routinely subjected to harassment and death threats from hate-filled Multiculturalists. Critics of Multiculturalism have lost their jobs, had their businesses attacked, and even subjected to violence. Multiculturalists commonly organise boycotts of anyone involved in business who has criticised Multiculturalism, often threatening business customers and suppliers with similar attacks unless they submit to joining in boycotts, and when boycotts and intimidation doesn't work, then violence may be applied. These are the common tactics of Multiculturalism, used to silence critics. 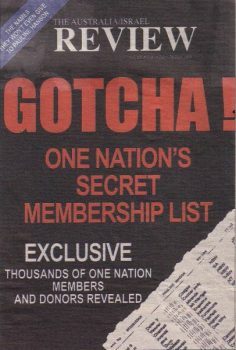 When the Australia-Israel Review published a list of names of several hundred One Nation members in July 1998, using the front cover headline of "Gotcha! ", it was yet another example of Multiculturalists willing to intimidate their political opponents. It was an open invitation for Multiculturalist thugs to commence harassment against those named in the published lists; it was a tactic to create a climate of fear; it was typical Multiculturalist thuggery. 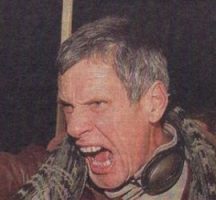 Scott Balson, in his book Murder by Media, condemned the Review's tactics. 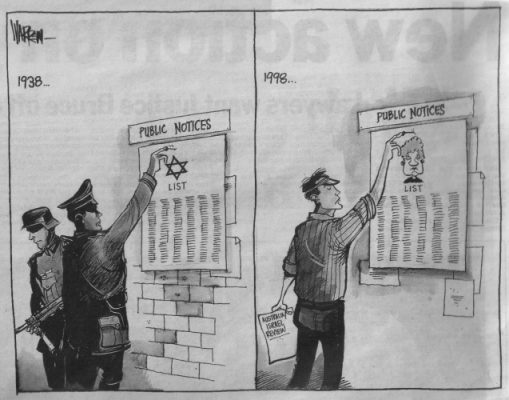 The unauthorised and intimidatory publishing of the list of names and their suburbs smacked of Nazism - it was the very intimidation that Jewish people complained of and warned about. Incredibly the Murdoch media, with one exception outlined below, did not condemn the bastardry of the men and women who were behind this appalling behaviour. The vilification of One Nation has been so intense only people with courage 'came out' as supporters. It was not paranoia to be alarmed at the prospect of exposure. Ron Brunton, an anthropologist with the Institute of Public Affairs, and of Jewish ancestry, writing in the Courier Mail of 18 July 1998, agreed. Last week the Australia/Israel and Jewish Affairs Council screamed 'Gotcha' to One Nation. �the council published the names of 2,000 members of Pauline Hanson's party in its magazine, the Australia/Israel Review. Like a great many other Jews, I was angry that such a nasty and foolish deed was carried out by a group which wants to be seen as serving the interests of Jewish people in Australia. Although it is a small private body, the council's name caused many non-Jews to believe it is a representative organisation. ...The magazine also claimed that it had withheld the addresses and telephone numbers of members 'in the interests of privacy'. But the magazine did not care tuppence about anyone's privacy. It is very easy to work out the details of many people on the list, especially those with less common names or who live in small towns. Using a sample of 250 names as a test, I was able to discover the full addresses and telephone numbers for around 30 per cent in only a couple of hours. Given the physical violence that has already been directed against One Nation supporters, publication of the list can only be seen as intimidation---not against extremists who have infiltrated the party, or its autocratic leaders---but against a rather haphazard collection of ordinary people who have joined One Nation for a variety of reasons. Had an Arabic newspaper, or a magazine of the anti-Israel hard left published a list of members of a Zionist organisation, there would have been much justifiable outrage and anxiety in the Jewish community, and the Australia/Israel Review would have led the condemnation. There are a couple of other interesting ironies in the Australia/Israel Review's action. I suspect that many of those it has 'outed' and left vulnerable to harassment and worse are people who strongly support Israel. The bulk of One Nation's members are probably people with socially conservative, rather than racist or anti-Semitic attitudes. Such people tend to admire Israel because of its strong sense of national pride, its compulsory military service, and what they see as its uncompromising and unsentimental approach to Palestinians and the Islamic world. And some other members of One Nation are likely to be fundamentalist Christians who support Israel because they believe that its existence fulfils biblical prophecies. The other irony is perhaps even more difficult for the Australia/Israel Review to acknowledge. But by comparison with some of the groups which play a prominent and influential part in Israeli politics, such as the National Religious Party, Pauline Hanson and her One Nation party are really quite moderate. And Israel's immigration program, which is designed to preserve the Jewish identity of the nation, is no less discriminatory than One Nation's desire to ensure that Australia's immigration policies maintain our essentially European character. Although there are some Jews both inside and outside Israel who would like the country to change its ethnic policies - the so-called 'post-Zionists' - the chances of this occurring in the foreseeable future are very slender. ...Unfortunately, the Australia/Israel Review's offensive and counter-productive action against One Nation is an example of a more general phenomenon. Members of other ethnic groups are also frequently angered and embarrassed by statements supposedly made in their name by self-serving and unrepresentative 'spokespeople'. It is the price we ethnics pay for the debased and politicised form of multiculturalism that has taken hold in Australia. The anti-democratic actions of the Multiculturalist thugs show themselves as the true successors to the tradition of the Nazi thugs of the 1930s Germany; whereas the victims of the Multiculturalist thugs belonged to the tradition of the democratic Australian patriotism of the early twentieth century. Facing the Nazi-style tactics of the hate-filled Multiculturalists, the Jewish members of Pauline Hanson's One Nation Party must have felt a heavy irony.